This family tree (above) shows those members of the Devlin family who were most closely connected to the business of T L Devlin, trawler owners, based at Granton. i.e. Thomas Leishman Devlin, his wife and his direct descendants. I have also included John Devlin and family because of the interest shown by John's grandson (also John) in researching the Devlin family. 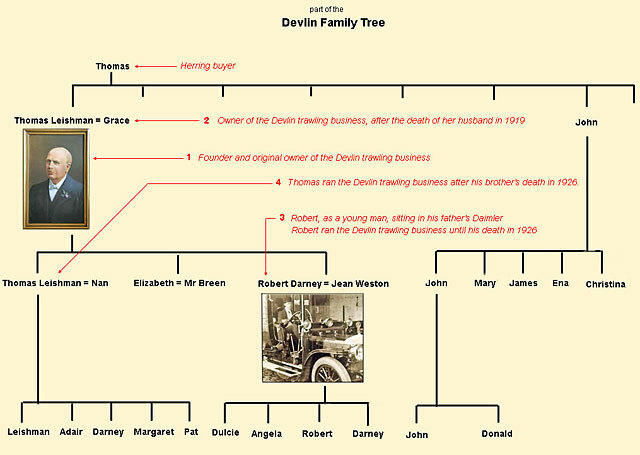 For further details please click on 'The Devlin Family' links, below the family tree. Founder and owner of the business of T L Devlin, trawler owners, until his death in 1919. 1850-1941 - Or is it? Wife of Thomas Leishman Devlin, owner of the business after his death. i.e. from 1919 to 1941. Son of Thomas Leishman Devlin, Manager of the business after his father's death, 1919-25. Son of Thomas Leishman Devlin, Manager of the business after his brother's death, 1925-41. There were several generations, all named John Devlin. - John Devlin1 (1866-1920). He was the brother of Thomas Leishman Devlin. - John Devlin2. (1901-1992). He was son of John Devlin1. He was born in Scotland and died in US. - John Devlin3. He lives in US and is now researching the Devlin family history. He is the son of John Devlin2. - John Devlin4. He is son of John Devlin3. - John Devlin5. He is son of John Devlin4. John Devlin, now living in Sun City, Florida, USA is trying to discover more about the Devlin family who lived in Newhaven, Edinburgh. In particular he'd like to find a photograph of Grace Devlin. If you can help with this request, please email me, and I'll pass your message on to John. 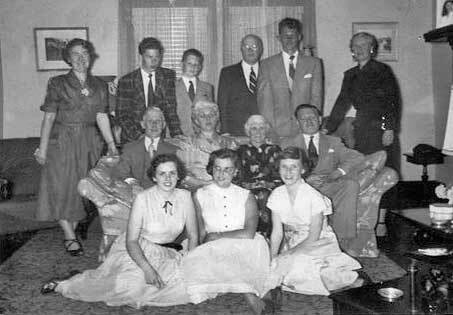 Here is a Devlin family photo, sent to me by John Devlin. - Peggy's son Brian Devlin. - Peggy's husband George Spiro. - James Devlin's wife, Peggy. - my father John Devlin. - my father's sister Ena (Devlin) Spiro. - my grandmother Christine Devlin. - my father's brother James Devlin. - Ena's daughters, Barbara and Jean. This is the only photo I have of my grandmother Christine Devlin, my father John Devlin, his brother James Devlin and sister Ena Devlin together. I have no recollection of this ever having happened before or after. This occasion may have been when I was leaving for Korea."